The tone of his voice, the calmness in which he speaks, would never suggest that Jonathan Quick is in the midst of hockey's most intense times. Of course. No problem. Be happy to talk later today. Give you a ring after we practice. Even his text messages bring out his laid-back demeanor, a big-time backstopper without a big-time ego. Welcome to the world of Jonathan Douglas Quick. 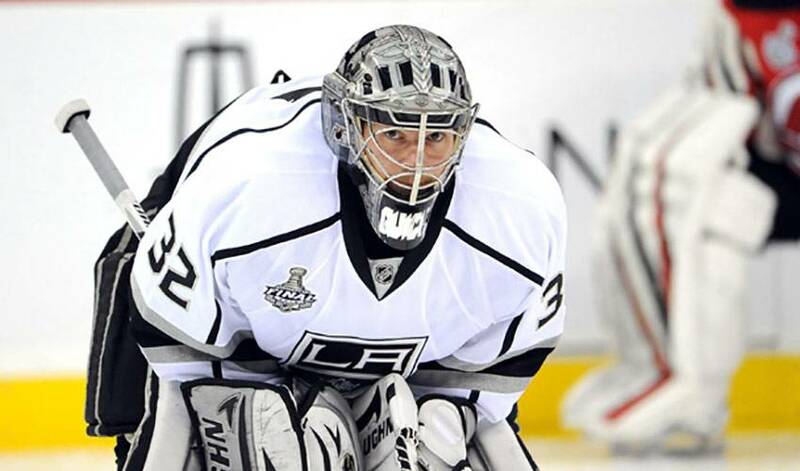 He's been one of the best goaltenders in the league in 2011-12, both in the regular season and playoffs. Quick recorded 35 wins for the second straight campaign, set a career-best mark with 10 shutouts and a paltry 1.95 goals against average, along with a stellar .929 save percentage. Quick, the 72nd overall selection of the Kings in the 2005 NHL Entry Draft, was a major reason Los Angeles took out the No. 1 seed Vancouver Canucks in the first round of the Western Conference post-season, setting them up for a second-round series against the No. 2 seed St. Louis Blues. After two games, both contested in St. Louis, Quick and the Kings have a 2-0 series lead, punctuated by an authoritative 5-2 win in Game Two. As for what he was most proud of when it came to his performance in the West quarter-finals, the Connecticut native's answer deflected any praise away from himself. Quick, who was recently nominated as a Vezina Trophy finalist, along with Henrik Lundqvist and Pekka Rinne, admitted it was a major accomplishment to get by a high-quality opponent. Quick, who earned his first career NHL playoff shutout on April 17, 2011 against San Jose Sharks stopping all 34 shots for a 4-0 win, notes unselfish play and a total team effort as the main reasons why the Kings have gone on to contest the West semifinals. Quick will be counted on to come up big again against the Blues. In Game One, he did, allowing just one puck to get by him in a 3-1 Los Angeles road win. He was also strong next time out. That's why Kings fans shouldn't get rattled should Quick give up a soft goal. The man behind the mask certainly won't be. With the way he's playing, Quick, in the midst of his third consecutive playoff appearance with the Kings, is certainly inspiring confidence in his teammates, as they look to bring Los Angeles its' first Stanley Cup. And whether he's making a game-winning save in overtime, or spending time away from the game with his family, nothing ever seems to rattle the calm, cool and collected man in the crease. That's just Jonathan Quick's way.